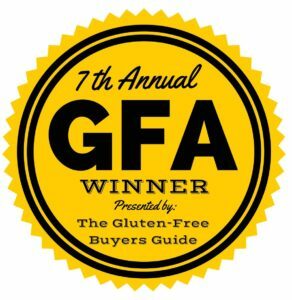 gfJules All Purpose Gluten Free Flour - voted #1 by GF consumers! Voted #1 Gluten Free Flour in 2016, 2017 & 2018 by GF consumers! NOT brown-rice-flour based, so NO GRIT! Use it 1-for-1, HONEST! You’ll see! Read the ingredient list of most of the gluten free flours on the market and you'll see 'brown rice flour' leading the way. That's because it's one of the cheapest gluten free flours most big brands could find when they decided to grab their piece of the 'gluten free movement.' Only problem is, that brown rice flour is NEVER going to be all purpose. It's dry, gritty, won't hold together. Maybe you've experienced some of these results first hand? Playground sand is gluten free -- but you wouldn't want to bake with it! Jules didn't set out to grab a piece of the gluten free movement. She quietly set out to create a blend of gluten free flours that would yield the decadent, moist, never-gritty baked goods she wanted to be able to bake again after her celiac diagnosis. She wasn't looking for the cheapest ingredient--she searched and found the BEST ingredients (and brown rice flour didn't make the cut). Two years later, her gf friends were begging her to make her flour blend for them. Fast forward several years and Jules' gfJules Flour beat out EVERY other gluten free flour to win the #1 spot according to gluten free consumers -- 3 years in a row! The gluten free flour voted #1 (3 years in a row!) helps you live gluten free, conveniently. gfJules is consistently voted the best gluten free flour by GF consumers because it works. Just like a flour you’d hoped to find to replace your wheat flour. That’s exactly what Jules set out to do, and what she didn’t stop trying to achieve until she’d achieved it. Good for you! Now you can buy one gluten free flour to use in all of your recipes. Your great aunt’s pie crust, your mom’s dinner rolls, an awesome-looking cookie recipe you stumbled across. Jules’ all-purpose gluten free flour epitomizes the word “all purpose.” The five flours plus xanthan gum she painstakingly combined and re-combined and tested and tweaked mimic the bulk-to-starch ratio of wheat flour. Which means it performs like wheat flour in all of your recipes. And defies belief on a daily basis. If you’ve heard or read (from ‘experts’) that you have to make a special gluten free flour blend for every gluten free recipe, Jules is here to prove otherwise. Not to mention it’s a big and messy and time-consuming waste. The “Recipe” link at the top of this site has 400+ proven gluten free recipes as proof -– because they ALL rely on just ONE all purpose gluten free flour: gfJules flour. Get to know Jules. She’s nothing if not persistent. Sincere. Supportive. Positive. Informative. And thorough. Her gluten free flour is certified gluten free and kosher, and is totally non-GMO. And now it’s been voted — for 3 years in a row — the #1, best gluten free flour by thousands of gluten free consumers. Turn their satisfaction into your confidence to try this truly special flour today. Set a high bar. Try gfJules All Purpose Gluten Free Flour. End your search. When Jules launched gfJules, one of the things she wanted to do was offer choices. So you can now try her award-winning gluten free flour in a 1.5-pound size –- a more affordable way to see if all the glowing reviews are true (and that this isn't just a big-old conspiracy!). So now you can spend less on your tire-kicking first purchase of Jules’ flour. After you realize this is the last gluten free flour you’ll ever need, you’ll likely do as her ‘regulars’ do and start buying in bulk. Funny thing about gfJules Flour: the larger sizes are actually the most popular. What does that tell you? IMPORTANT: Only use gfJules All Purpose Gluten Free Flour … for ALL of your purposes! Really. Dust off your long-lost favorite, pre-gluten-free recipes and give Jules’ miracle flour a test drive. Check out some of the more than 400 recipes on this site –- ALL of which use this one amazing blend. Read the reviews—trust your fellow discerning gluten free bakers. Not quite ready to plunk down $9.50 plus shipping? Grab a $7.50 sample (FREE SHIPPING!). It's a 3/4-cup sample with half-recipe for 6 awesome muffins that’ll help you see, and taste, what everyone’s talking about. Jules will even send you a $10 gfJules Store Credit you can use on your first purchase of a full-size bag or 3! THAT’S how confident Jules is that you’ll love her unparalleled, never-say-no, truly all purpose gluten free flour. We’re talking about your future here! Your blissful, flavorful, compromise-free gluten free future! Read the flour reviews, and spend what you’re comfortable spending to put this life-changing flour to the test. You’ll see. As thousands have before you. You’ve never been closer to gluten free flour perfection!